«I’d like to highlight Nick’s ability for a team work. Interests and priorities of the team were always more important for him than those of his own. 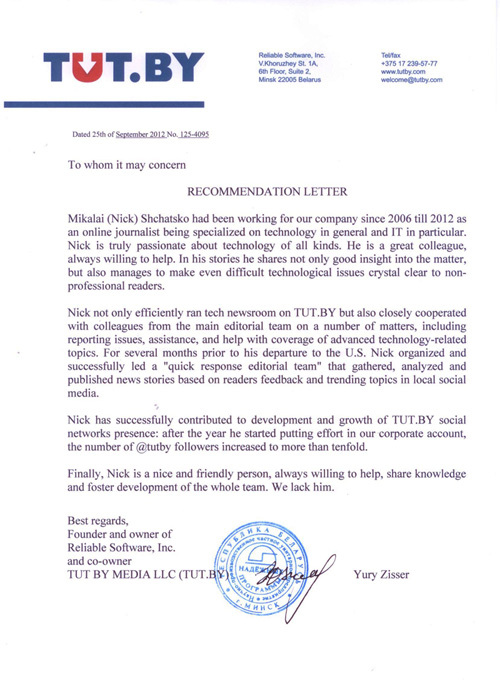 Founder of TUT.BY (TM of Reliable Software, Inc.), the biggest online media outlet in Belarus. Executive editor at TUT.BY, the biggest online media outlet in Belarus. Mikalai Shchatsko worked as the editor of IT.TUT.BY which is devoted to the Information Technologies. Mikalai is a gifted editor and journalist able to work efficiently and under pressure. He is always a generator of new ideas and is able to implement them in shortest terms. Mikalai is very much interested in self-education and studying experience of foreign colleagues. He is also enthusiastic about sharing his experience with his colleagues. Mikalai is intent and always accurate. During the last year Mikalai performed functions of the Operations Editor of TUT.BY portal being in charge for tracking all the information incoming to the portal through e-mail and social networks. Mikalai regularly and timely provided the Editorial Board with interesting and often exclusive information found in the social networks and on online forums. This gave us an opportunity to timely start working on topics of high interest for the Internet users. He also kept constant contact with our audience, anwsered the questions of the users and reacted on criticism. We are proud to recommend Mikalai to be a part of any media organization and wish him success in all his endeavours. We have been fruitfully cooperating with Mikalai Shchatsko for five years: 2007 to 2012. In that period Mikalai has proven himself as a highly qualified professional in the sphere of informational technologies, and also as a colleague and a friend you can always rely on. Mikalai covered web-hosting, domain names market, and HOSTER.BY achievements for TUT.BY on a regular basis. As a professional in technology matters, Mikalai contributed much to the development of HOSTER.BY: he assisted in our talks with ICANN on the issue of redelegation of the national top-level domain. He assisted in the coverage of the development of domain zone .BY, in our rollout of "Secure Hosting" service for government structures. HOSTER.BY is the technical governing body of the national domain zone .BY, the largest hosting provider and the leading domain registrar in Belarus. The company also holds a license to provide services for companies with access to state secrets.